Have a look at the residuals or error terms! The second part of the question can be answered easily. First, find a model that best suits to your data and then interpret its results. It is good if you have ideas how your data might be explained. However, interpret the best model, only. The rest of this article will address the first part of his question. Please note that I will share my approach on how to select a model. There are multiple ways, and others might do it differently. But I will describe the way that works best for me. In addition, this approach only applies to univariate models. Univariate models have just one input variable. 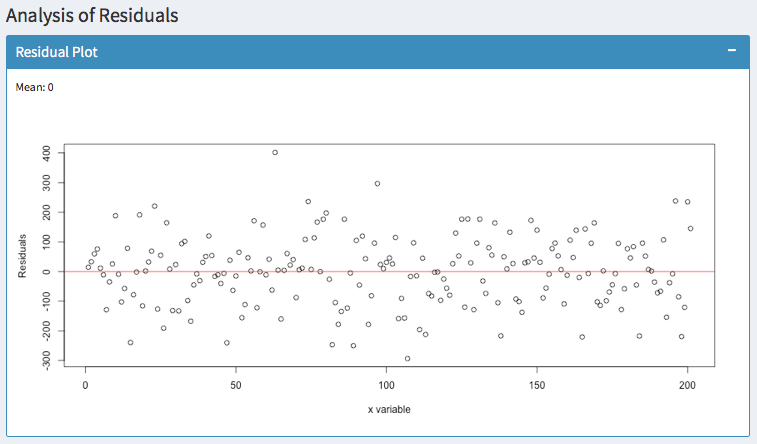 I am planning a further article, where I will show you how to assess multivariate models with more input variables. For today, however, let us focus on the basics and univariate models. To practice and get a feeling for this, I wrote a small ShinyApp. Use it and play around with different datasets and models. Notice how parameters change and become more confident with assessing simple linear models. Finally, you can also use the app as a framework for your data. Just copy it from Github. If you only use one input variable, the adjusted R2 value gives you a good indication of how well your model performs. It illustrates how much variation is explained by your model. In contrast to the simple R2, the adjusted R2 takes the number of input factors into account. It penalizes too many input factors and favors parsimonious models. In the screenshot above, you can see two models with a value of 71.3 % and 84.32%. Apparently, the second model is better than the first one. Models with low values, however, can still be useful because the adjusted R2 is sensitive to the amount of noise in your data. As such, only compare this indicator of models for the same dataset than comparing it across different datasets. Before you read on, let’s make sure we are talking about the same SSE. On Wikipedia, SSE refers to the sum of squared errors. In some statistic textbooks, however, SSE can refer to the explained sum of squares (the exact opposite). So for now, suppose SSE refers to the sum of squared errors. Hence, the adjusted R2 is approximately 1 — SSE /SST. With SST referring to the total sum of squares. I do not want to dive deeper into the math behind this. What I want to show you is that the adjusted R2 is computed with the SSE. So the SSE usually does not give you any additional information. Furthermore, the adjusted R2 is normalized such that it is always between zero and one. So it is easier for you and others to interpret an unfamiliar model with an adjusted R2 of 75% rather than an SSE of 394 — even though both figures might explain the same model. What is often ignored are error terms or so-called residuals. They often tell you more than what you might think. 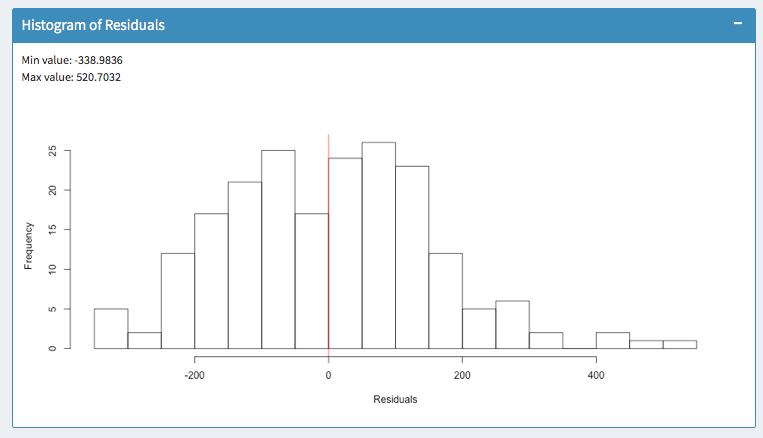 The residuals are the difference between your predicted values and the actual values. Here, I tried to predict a polynomial dataset with a linear function. Analyzing the residuals shows that there are areas where the model has an upward or downward bias. For 50 < x < 100, the residuals are above zero. So in this area, the actual values have been higher than the predicted values — our model has a downward bias. For 100 < x < 150, however, the residuals are below zero. Thus, the actual values have been lower than the predicted values — the model has an upward bias. It is always good to know, whether your model suggests too high or too low values. But you usually do not want to have patterns like this. 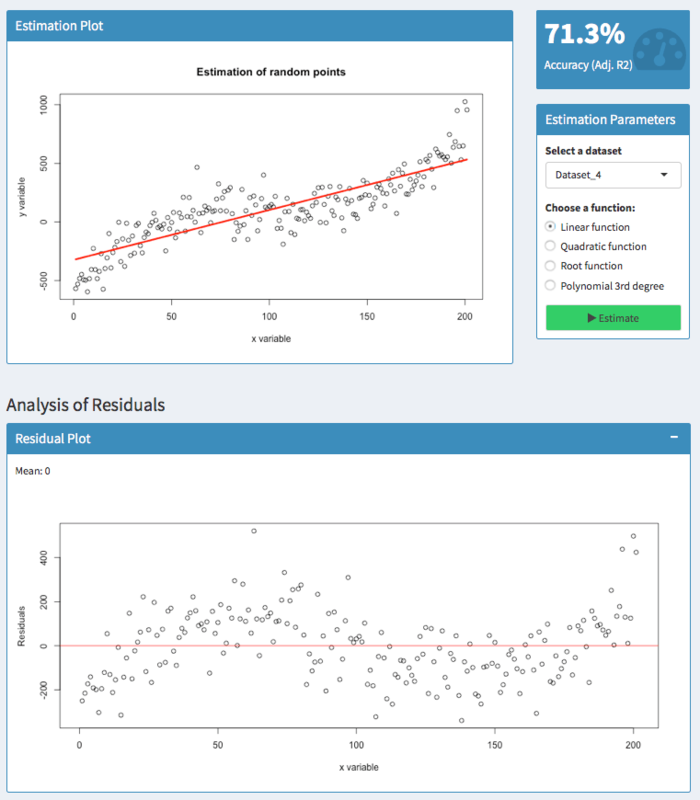 In addition, you can observe whether the variance of your errors increases. In statistics, this is called Heteroscedasticity. You can fix this easily with robust standard errors. Otherwise, your hypothesis tests are likely to be wrong. The above screenshots show two models for the same dataset. In the top histogram, errors occur within a range of -338 and 520. In the bottom histogram, errors occur within -293 and 401. So the outliers are much lower. 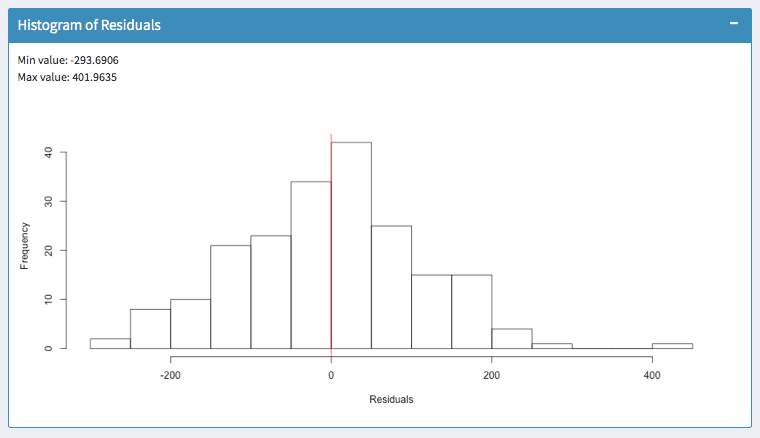 Furthermore, most errors in the model of the bottom histogram are closer to zero. So I would favor the second model. Only compare linear models for the same dataset.